Elevate Your Operations and Get Secure with Michigans Most Reliable, Safe and Secured transportaion Services for Financial Institutions, Provisional Centers, Cultivators, Processors, Laboratories, & Cannabis Dispensaries. Increase your Profits & Efficiency by our automated delivery and tracking system. Our optimized routes reduce delivery time & cost. Our state of the art on-demand delivery apps for our clients with complete delivery service management software for your business. Our clients can easily request pickup & delivery service directly on your delivery web or apps in a hassle-free way. Our clients are updated throughout the order delivery lifecycle by sending them real time SMS alerts or emails at various stages. Our clients are able to chat with their assigned agents. Our smartdashboard to receive & manage pick up and delivery and on demand delivery requests from all sources at a single place. Track complete order fulfilment cycle from order received to dispatched to delivered. Take in time actions like delete, cancel and re-assign delivery with a single click. All with our complete delivery manager software. Integrated with our app to place inventory you desire to ship, also to Insure your cargo. Change the way you meet cultivators, provisioning centers, processors, and laboratories expectations with a seamless and simple end-to-end experience. Delight your yourself with complete order and delivery management solutions. Place orders, monitor delivery time, multi-deliveries at any given time, manage re-routed orders, cancelled and delayed orders, and much more to help you take control of your business. Optimize deliveries with complete delivery manager software. Our route optimization engine picks the shortest & fastest routes helping you manage multiple deliveries with cost reduction and efficiency. We Use State of the Art Delivery Route Mapping to reduce ETAs on deliveries ensure an exceptional delivery experience for our Clients. Declared value of any shipments represents our maximum liability with shipments. On The Go Michigan Transportation Services will save you time and money. Michigan has mandated a law requiring 3rd party transportation, a requirement for all assets and currency to be transported with a transportation company like OnTheGoMichigan. When transporting precious assets from location to location, vulnerable of the threats and dangers from the criminals who are seeking to disrupt the flow of business. It is important to work with a professional, secured transport service that offers protection and experience for our clients assets. Our vehicles are state-of-the-art in terms of security, surveillance, GPS tracking, and thoroughly vetted and trained drivers. Our team is professionally trained and compliant for all types of deliveries. Licensed and insured, we go into great depths to ensure deliveries arrive safe and secure on a timely manner. Most trusted secured transportation services for the cannabis industry of Michigan. On-the-Go offers 24 hour online order submission and dispatch service making us the most convenient courier service available. 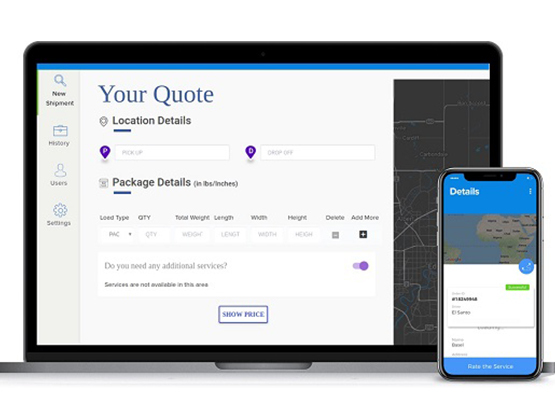 Allowing our clients to tracking their package from point A to point B with our real time online platform, mobile app services, SMS notification and email tracking integration services. Customers choose On The Go Michigan Transportation Services because of our reliability and discretionary practices. Our goal is to ensure that your product is covered without any risk to reputation or legal repercussions. That is why we follow federal and state law guidelines for everything we transport and do so in a way that makes our business shine above all others. With discretionary security, we provide a more secure way to protect your investment. We care about our client’s success, and to make our clients successful, we always go the extra mile. Whatever type of security you are looking for, we have a solution that will combine multiple points of risk assessment and management. We Help You Over Come The Complexities Of This Industry. Secured Transportation providers such as OnTheGoMichigan, will at all times be compliant of all applicable local, state, and federal laws. We hold in good standing any and all required insurance coverage, bonding, licenses, permits, and certificates required by the state of Michigan. OnTheGo carries all applicable industry and accreditation standards relating to the maintenance of all equipment used for logistics. Large and Small operations are at risk with criminal activity rising around cannabis establishments. When more crime occurs at the retail and delivery level, there are many people who are seeking teams with expertise to transport items safely and securely, while also being able to protect the asset as best they can.